Right about now the one thing that's popping up on restaurant menus with more regularity than the dreaded poutine is cassoulet, and it sure seems like there are a lot of riffs on the traditional meaty southwestern French white bean stew. When The Southern opens on Friday, Cary Taylor will be serving his with black-eyed peas instead of white beans. A nice little crock of two-bean cassoulet is served as a side at Balsan, the Lilliputian answer to John Manion's Brobdingnagian lamb-meatball-and-smoky-merguez-filled cauldron at Branch 27. But for traditionalists, this week Rob Levitt has been running a three-course $60 cassoulet dinner for two at Mado, for which he made his own saucisse de Toulouse, the fresh pork sausages that go into time-honored versions of yore. Up until now ambitious home cooks here in town, otherwise planning to set aside days of preparation and reserves of confit had no choice but to grind and stuff their own as well. (Or sub in some bratwurst.) There simply was no saucisse de Toulouse to be had. Now the good folks over at Provenance Food and Wine have taken in an order of sauccisse de Toulouse from the California charcutiers Fabrice Delices. While I'm waiting for federal funding to get my own cassoulet project going, I fried up a quartet of these plump little buggers (at $10.99). 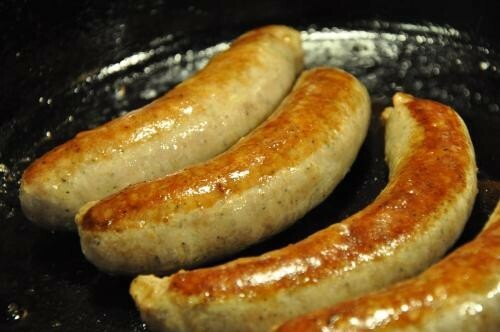 The comparison to bratwurst is no joke, but these have a more subtle and complex seasoning due to the inclusion of white wine, allspice, coriander, nutmeg,and caraway in the grind, which would be lost if you took the beer and onion route.